Published on Oct 15, 2017 at 10:55a.m. This is a BIG new feature that we just completed, and we have already deployed these features out to all of our customers. We are making customers aware of these important new features in our CMS now. What are Dynamic Department Pages? ​​​​​​For years, we have imagined a better way to design and manage the department home pages and department-level sections within a municipal website. When we are building websites for large municipalities (especially counties), they typically have MANY large departments and agencies that contain a lot of content in their sections of the website. These departments are so large, that they require a better content management strategy. We now finally have that solution. In this article we will describe how we are solving this challenge. We researched the websites of large municipalities and counties from across the country for inspiration in how they manage department pages and directories. One website that really stood out to us was Baltimore County Maryland. The website has no mega menus at all - something that is very odd for a large county. And yet, the website was voted as one of the best county websites in the country. The reason there are no mega menus is because the department pages are built around a directory system, which is what we wanted to build. 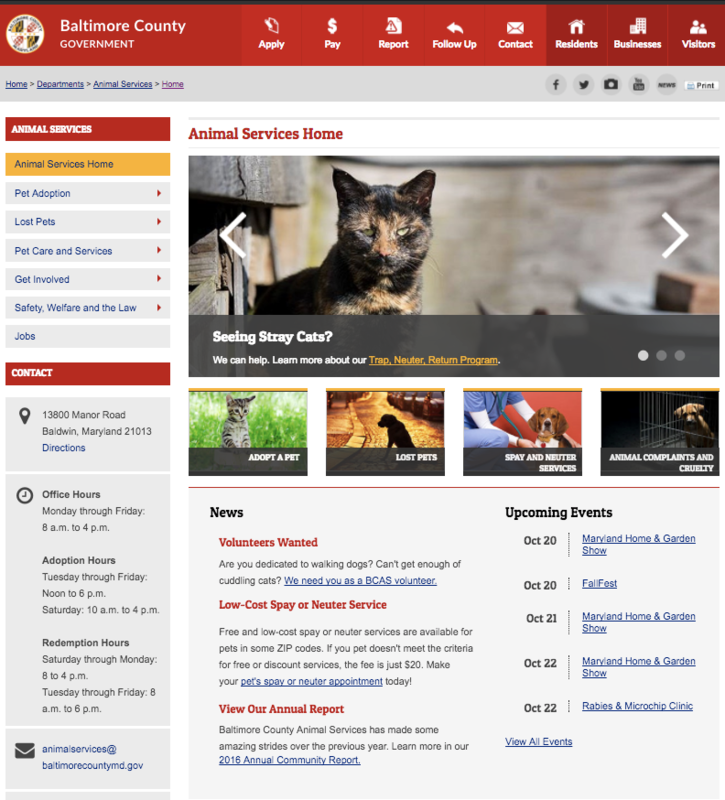 Below is a screen shot of Baltimore County's Animal Services department. Note how the side menu keeps you in the department's content. Also note the lack of mega menus. Department home page content includes a slideshow, action buttons, navigation menu, news, events, map location, content information, static content, and more. What we wanted to do was take a layout like this, and make EVERYTHING configurable automatically, making it easier for employees in a department to manage their own areas of the website more effectively. We asked ourselves this question: "why should a department have to look at the content managed by other departments in the CMS?". And this was how we identified the major challenge behind how this new system works. If the goal is to ONLY see your own department's content when you log into the CMS, then there would need to be a way to know which departments own which content areas. This would require us to relate ALL content in the website CMS with departments (or groups). So that is what we did - all content and applications in the CMS are now relatable to specific departments. Once we were then able to identify all of a department's content, we created a section in the CMS just for managing that department's content and menu systems. A department's navigation menu is typically the side menu that you see when you are within a department's area of the website, and that also needed to be manageable. Below are some of the new features of this system. Dynamic Department Home Page - a layout tempalte is automatically built for the department, and the department's home page has a custom (yet simple) URL. Dynamic Directory - The new system creates an alphabetically-organized directory with a built-in search engine. You can get to this new system at /directory in any website. News - automatically shows the news area for the department on the home page of the department. Menus - Manage ALL content that the department owns, and organize it the way you want at the department level. Links - Manage hyperlinks for your side menu in the menu management. Files - Manage links to important files for each department. Maps - System creates an office map for the department. Hours of Operation - automatically created and formatted contact and hours of operation information. Contact Information - Allows automatic selection of who the main point of contacts are. Home Page Content - Change the content of the department's home page centrally. Friendly URLs Everywhere - All applications in our CMS use friendly URLs. Now that we have department content centralized and secured, this is a big step towards our role-based website management dashboards, which are coming next.